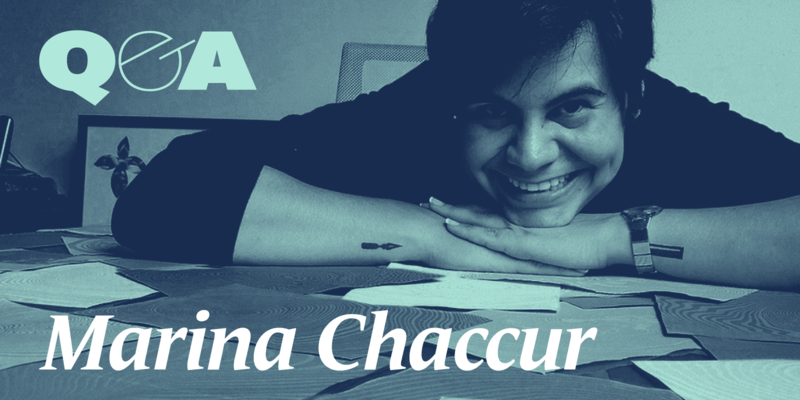 It’s my pleasure to welcome our very first Q&A interviewee for TypeParis17: Marina Chaccur! Marina is a widely trained and highly skilled lettering artist and designer—take a look at her lovely work here. I hope you enjoying reading through her interview. Tell us a little about what sparked your interest in type design and lettering. Marina Chaccur: It was a combination of experiences and developments. From calligraphy in school (so many stories there!) to playing with my grandfather’s typewriter during summer vacations. But I think there are probably two main reasons for having entered this field. When I was in college, it was about the time that typography and type design started to become popular in Brazil, with initiatives like Tupigrafia magazine, Tipografia Brasilis—which became part of Letras Latinas and then Tipos Latinos—workshops and so on, and I was in the middle of this, being in contact with the professionals promoting these events. But on a more personal level, some people in my family are very good at writing, to the extent that an uncle, who was a journalist, published a famous manual on how to write. Well, I struggle with writing, so I draw. Still, I am always amazed by people who can express their ideas and feelings in brilliant ways. So, I feel that most likely, because of my lack of aptitude to express myself so well and beautifully through written words, I went into the business of giving shape to the words of others. I feel that most likely, because of my lack of aptitude to express myself so well and beautifully through written words, I went into the business of giving shape to the words of others. Now, I know you have a special affinity with a particular typographical ornament, known as the Kaba Ornament. How did this come about? The Kaba Ornament is simply the-best-ornament-ever-created! In my opinion, of course, but well, it is. Always been in love with decoration and patterns, but it was Paul McNeil, my tutor during the MA Graphic Design at LCC, who pointed out that type ornaments could be an interesting subject for my final project, since I had clearly showed interest for type and ornaments. So I started my never-ending research. A few years later, during MA Type and Media at KABK, we visited de Uitgeverij de Buitenkant and I saw the proofs for one of the two Kaba books they printed. The sketches from Bram de Does immediately spoke to me and I fell in love with Kaba at at first sight. Learning from others, definitely. I do value a lot the time when I am alone testing ideas, playing with different tools and trying to push myself forward, but I wouldn’t be where I am if I hadn’t got in contact with so many wonderful teachers and professionals along the way. I am not only talking about formal education, but also extra activities like independent workshops, talks, conferences, etc., plus discussions with colleagues, which can be highly productive and inspirational. Each one, in their own way, made me question my processes, results and be better. What do you love about the type design community? Are there are any negative traits or attitudes within the industry that you would like to see change? Oh boy! Good questions. I think there is a lot of generosity because many people are willing to help each other and share their knowledge. David Lemon’s retirement speech at ATypI Warsaw was a very touching one and emphasised that. Even thought there is competition, collaboration is also present, which can be seen in the development of variable fonts for instance; how people and companies joined forces to create the new format, which is still in development, but already being presented to a large audience, from many different perspectives, in different occasions. On the other hand, I understand that the discount race has become a business model some people thrive on and popular places make it possible for newcomers to get into this “game” and start to earn something from their type design results, however, that is certainly not the only way to go, so I would like to see more and more people stand up for their work. I think there is a lot of generosity [in the type design industry]… many people are willing to help each other and share their knowledge. So many things! But easy ones to point out are food and nature. I make experiments in my kitchen almost daily, mixing ingredients and flavours for my meals, and it is always an interesting play of textures and colours, two factors that are also the ones calling out my attention when at the beach, the park or simply looking at the sky. I don’t usually take a lot of photos, in general, but you can find some of these on my phone. Hahaha, all right. Some years ago I was calligraphing about eighty certificates for the Mohawk Show, hired by Pentagram in New York. Among the award winners was Michael Bierut, and of course I had to misspell his name, writing Beirut. I was so embarrassed when they got it and called it out! I apologised wholeheartedly and he was very nice about it, as apparently it is a common mistake. Good thing is that I was sending them in batches and far enough in advance, so there was still time to do it again and send the correct one in the following package. On the non-type related side… I left my two cats in Brazil with my parents, and I missed having a pet at home, so last year I adopted a cutie the shelter called Winfrey and I renamed to Oprah (so much for originality, right?). Well, being from São Paulo and living in high buildings, my cats didn’t go outside. A few months ago I posted on Facebook, on my personal profile, how anxious and worried I was about the fact that she could go to the neighbours balconies once I started opening the windows for Spring time. Got some really nice comments and advice. Little did I know some weeks later she would find her way to the gardens and explore the block even further. Past nights she has been breaking my heart when she fights with another cat outside and takes a long time to come back home after that. I know, sounds silly, but it is true and I will eventually learn to get used to this and hopefully she will keep coming back in one piece. Thanks for the questions. It is always a great exercise to (re)evaluate one’s own process and choices.